"I'm just very curious. I'm trying to identify it." Originally, Mr Hanlon thought he may have just taken the photograph at the same time the lights on an aircraft were flashing, but was told by an "expert" that couldn't be the case. In the half an hour he had been taking photographs, he also hadn't heard anything like the engine of an aircraft, which he found odd. And he's not the only one who has spotted strange shapes in the sky. Wollongbar resident Maurice Collins said he noticed a strange light around midnight on Tuesday. "It was too slow to be a shooting star," he said. "But it was too fast to be a satellite. "It was like a really, really bright star, heading east to west in the northern sky. "Maybe it was space debris. "I was just wondering whether anyone else had seen it. It was really bright." Spotting unusual objects in the sky is certainly not a new phenomenon. On May 29, 1950, The Northern Star reported on a "Saucer Mystery" in Coraki that had been puzzling residents for two weeks. A Mr C Hetherington of Bora Ridge said he saw a "shining light" which looked about the size of a football. However, with the help of a telescope it was discovered the obscure shining light, spotted at 7.46am, was in fact just an aircraft reflecting light in the morning sun. The finding ruled out a further seven or eight saucers that had been spotted coming into Casino within the two-week period. Evans Head Memorial Aerodrome Committee president Richard Gates said the object in the image looked like the International Space Station. 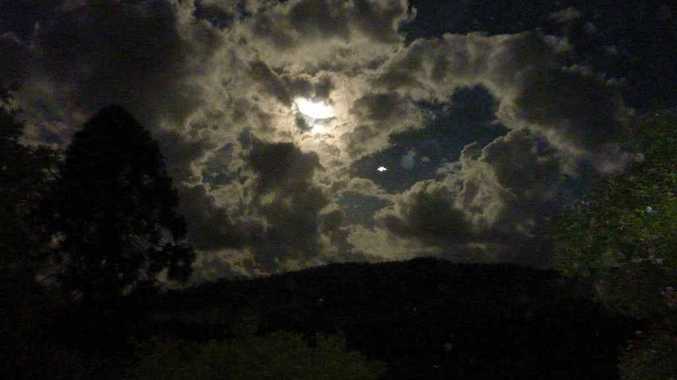 "It moves across the sky rapidly in a matter of minutes and does not follow the same path night after night," he said. "I have seen it described as the third brightest object in the sky. "You can even see it through all the visual pollution of the night sky in the city."